Yesterday morning on our way to town, Mark and I had a moment of gratitude. First, though, we had a fender bender. As we drove the windy country roads from our house into town, along came a car around a blind curve in the opposite direction, barreling along at top speed. Mark and I both cursed, he swerved right, and thankfully, so did she, but not soon enough to miss clipping the front of our van. The road was now strewn with broken pieces of car and we all emerged to survey the damage and take photos of license plates, insurance cards and id. The other driver was young and shaken and apologetic. We were businesslike and not too patronizing. When we got back in the car and on our way, it suddenly hit us how narrowly we’d just missed having a head-on collision. My gratitude for Mark’s cautious driving and cool head was deep. (You might have seen my post on Facebook.) I tried to not lean into all the ugly, terrifying and brutal stories that my brain began to conjure up. We were fine. It was just a broken bumper. But having gratitude in that moment brought everything into sharper focus. As does any near miss or brush with death. Those moments when you find yourself on the precipice of disaster are the moments that make you wake up and quickly assess what is most important in life. (I know you know this all too well.) And what falls away is the fluff, the extras, but oddly, often the things that take up so much of our time, energy and resources. It might not surprise you that with Thanksgiving around the corner—and yes, it is politically incorrect and in need of a major makeover—I’m going to talk about gratitude. And I’m going to suggest that we look at this season as an opportunity to cultivate some gratitude, and not just wait for the crisis, but notice the deceptively small, and yet large, things that are the blessings in our lives. Dr. Robert Emmons, a professor of psychology at UC Davis, has studied gratitude for years and his research has shown that we reap benefits from cultivating gratitude. We feel more connected to others, we feel more alive, alert and awake. Gratitude even has health benefits, lowering blood pressure, strengthening immune systems, and improving sleep patterns. He defines gratitude as both the affirmation of goodness in the world and the recognition that we are part of something bigger than ourselves. That that goodness and those blessings comes from someone else, something else beyond ourselves. You enfold me in this bath towel. Sometimes, though, it’s hard to feel gratitude, let alone thank God, when we are suffering, when someone we love is suffering, when the world is suffering or full of smoke or the flames of hatred are being fanned. And yet, it’s in those moments I think we need gratitude the most. It’s the simple things in life, or the tenderest moments, or those little acts of kindness—the ones we tend to overlook, that go to the deepest place and open us to gratitude. Rabbi Barenblat says, “It seems to me that gratitude is an attitude which may be a precursor to giving thanks... and sometimes giving thanks is a way of cultivating gratitude. For me, cultivating gratitude means being present enough to notice the blessings amidst the woes, or the roses amidst the thorns. I tend to live in the tragic story, I am an incessant worrier, you didn’t know this about me? Oh yes, I am. Give me a 99 to 1 percent chance of something happening and I’ll always consider it possible that I’m the 1 percent. I love to fill the void with the bad story. But life has taught me otherwise, that despite what I might think most of the time, so much good comes from the not good, and noticing this makes me feel the gratitude…the gratitude for the ugly stuff as much as the beautiful. My son Toby, my youngest, is a talker. He loves to tell his stories. And when he was little—he’s almost 18 now—and I would put him to bed, he would regale me with the stories of his day. And even though he was overall an incredibly upbeat and positive, happy guy, and had an upbeat and happy life, at bedtime he would go on and on...and on…about all the terrible things that had befallen him that day. It was endless at times and, I had to say, so strange because he didn’t look unhappy and downtrodden all day! But for some reason at night he would get consumed with these injustices and need my attention and sympathy and it was, frankly, getting out of hand. One day I decided to teach him about not only editing his stories, but changing his perspective on his day. It seemed like a better way to head into dreamtime was in a place of balance and possibly even gratitude. So, I told him that when I was tucking him in, he could give me just one thorn from his day. And also needed to give me one rose. I told him that I realized there were probably more of each to tell me, but he could only pick one. And so, from that night on, I would ask him, “Do you have a rose and thorn from your day to share with me?” And I could feel a peace settle over him and me, and bedtime got much easier and more sweet again. It’s not that I want to avoid or discount the negative, it’s just that gratitude really is about perspective. And even when we can get completely overwhelmed and stuck in the painful brambles of our grief and our cynicism, if we take the time to notice the delicate roses or the sweet, juicy berries, or whatever beauty is growing there too, we can change not only our attitude. We can transform our life experience. As some of you know, our second son, Ben, went through a long spell of medical travails, ten years to be exact and fifteen surgeries. It was beyond hard. No question. It was brutal. 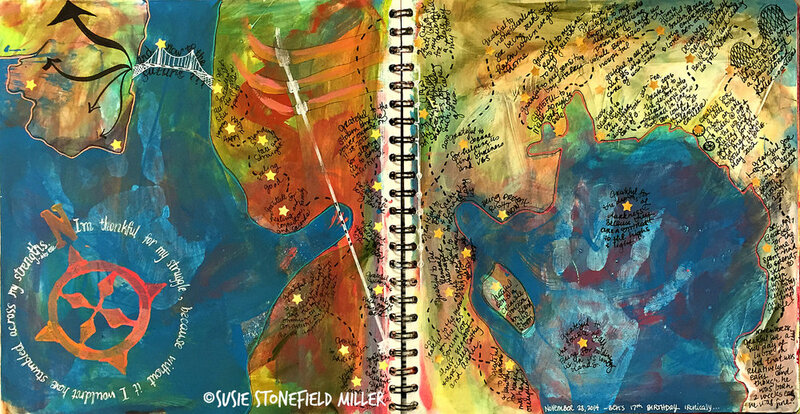 A few years ago, I was working in my art studio on an art journal page. It was Thanksgiving week. And I’d given my students the prompt to make a gratitude map. Map points of gratitude in your life. I found a page with leftover paint. It looked sort of map-like. I worked on it a bit. And then, since it happened to be my son Ben’s 17th birthday that day (he’s a Thanksgiving baby), I decided to make a gratitude map of his journey, which was my journey too, of course. Each one of these memories basically reminded me: We were here. We passed through here. We made it to this point. We survived intact. I marked each point of gratitude with a little gold star. As I worked on this page I felt as if I’d opened a tap and a flood of blessings poured onto the page. And when I stepped back and saw that this map … of this incredibly long and hard journey … was actually full of beautiful people and moments… I was reminded of how blessed you actually can be despite the suffering, despite the hardship. I invite you to take a moment and think of what might happen if you open the tap of blessings and gratitude and thanks in your life this Shabbat. And I invite you to do this by noticing the thorn and then, finding the rose. How might your perspective shift? And what other blessings might even arise from that? This piece was my drash, or sermon, presented on November 16, 2018 at Congregation Ner Shalom Shabbat services.